It's only a week and a half until Christmas - eeek! 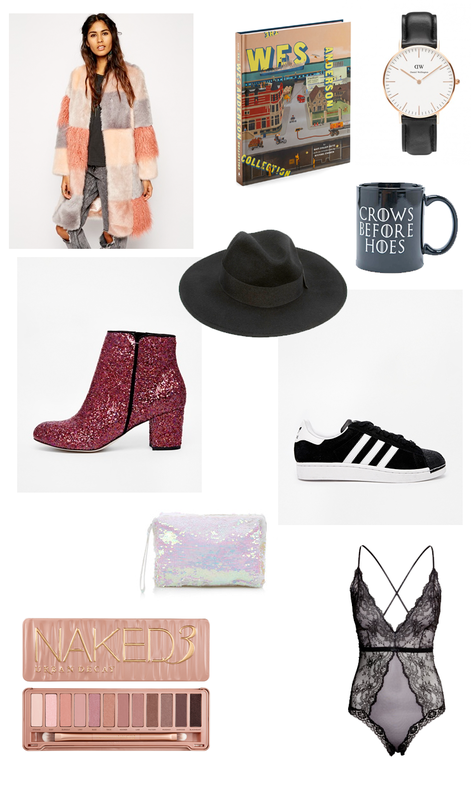 I'm a little bit late in posting a Christmas wishlist, but I've actually been feeling a little un-festive up until this weekend. I can't quite believe 2014 is almost at an end! This fabulous ASOS faux fur has had me pining the past few weeks that I haven't been able to afford it. I treated myself to this Story of Lola rainbow pastel number a few weeks ago, so it's probably not completely justifiable to purchase a second multicoloured dreamcoat within a matter of weeks... or is it? The guys at Daniel Wellington have already answered my Christmas wishes and treated me to their Classic Sheffield Watch in Rose Gold. I'm pretty smitten with it. Also, they're offering you guys a 15% off code with any orders made before Christmas. Make sure to order on or before the 17th December so your order arrives on time. All you have to do is pop the discount code HOLIDAYLEIGHTRAVERS in at the checkout. When I saw the 'Crows Before Hoes' mug whilst browsing Urban Outfitters I got overly excited. Considering I have a penchant for novelty mugs and like the rest of the world, I am a Game of Thrones super fan, this would make my morning coffee a million times better. Although I've never been one to jump on the beauty bandwagon, I've found myself coveting an Urban Decay Naked Palette. This could be due to the face I've started to apply my eyeshadow like a grown woman rather than a 12 year old girl dabbing her fingertips in the pot. Santa, please take note of all of the above. I'm in love with the faux fur coat and the beautiful lacy lingerie piece!